With blue-chip OEM customers throughout the world, the company turned to MecWash Systems of Tewkesbury, Gloucestershire, UK when it came to investing in a component washing system capable of not only meeting, but exceeding the stringent standards of the automotive sector. Grainger & Worrall, based in Bridgnorth, Shropshire, is renowned globally for being at the forefront of castings and precision engineering development and innovation, particularly for prototype engines and aerospace parts. Grainger and Worrall count many major OEMs including Jaguar Land Rover, Aston Martin and Maserati among its customers. The company commissioned the MecWash Maxi aqueous washing system with an Aqua-Save because of its versatility for cleaning all types of precision machined components, from small parts to blocks and heads for V8, V10 and V12 engine prototypes. “Our customers expect a ‘make like production’ solution. That means whatever we are producing for them has to be as close to what the final mass-produced part will be. This ensures testing is representative of the final product and significantly reduces time in bringing it to market,” said Mark Davies, plant director at Grainger and Worrall Machining Ltd.
“For that to happen we have to ensure there is no compromise when it comes to cleaning and degreasing any machined component. Even a microscopic contaminant can have a potentially devastating effect on testing and validation. He said the Maxi was a perfect solution as it is designed to clean complex and intricate machined parts, including the removal of many different types of contamination, like coolant and swarf. “The Maxi delivers unrivalled and repeatable cleanliness on even the most complex of components, harnessing the advantages of traditional agitation, jet wash and spray wash technologies,” he said. The addition of the MecWash Aqua-Save technology to the Maxi provides additional benefits for Grainger and Worrall. The Aqua-Save system can be used with MecWash’s complete range of washing systems. Its principal advantages include a reduction in effluent disposal costs of up to 95 per cent and extending the time between changing wash solutions, reducing down time. The Aqua-Save range recycles 15 to 50 litres an hour and the system can be used for treatment of wash water, waste coolants and general wastewater. The system is also ECA allowance eligible. “Grainger and Worrall, like their global OEM customers, have no room for inefficient washing systems. They have to ensure the cleanliness standards are reaching the highest levels possible. 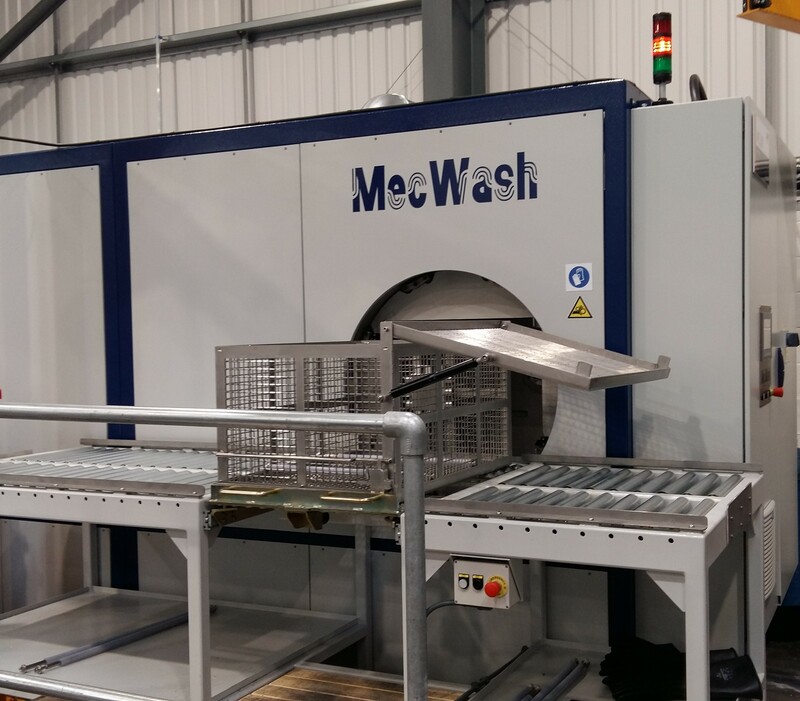 It is a testament to MecWash and our washing systems that they have chosen the Maxi as part of their significant investment in this process,” added John. As part of the commissioning process MecWash works with its clients to ensure its systems are operating to the highest levels possible. This includes using its in-house laboratory to develop and provide bespoke detergents used in the washing process. More details about the MecWash Maxi can be found at www.mecwash.com. Information about Grainger and Worrall can be found at www.gwcast.com.